This episode should’ve never worked. It was a one-off, inconsequential story about characters we’ve never seen before nor would ever see again. It had no battles, no enemies, no star trekking of any kind. And yet, “The Inner Light” from Star Trek: The Next Generation lives on; not just as one of the best episodes of Star Trek, but as one of the finest pieces of modern television. And I’m not the only one who thinks so. Airing during the show’s fifth season, “The Inner Light” is your classic “the road not taken” story. At the beginning of the episode, Captain Jean-Luc Picard is hit with a probe beam that transports him to another reality. In it, he’s an iron weaver named Kamin, living on a dying planet called Kataan with his wife, Eline. Most of the story takes place over the course of Kamin/Picard’s life. At first, he’s scared and suspicious, yearning to get back to his former life as a starship captain. As the years progress, he accepts and embraces his new reality, starting a family, integrating into the community, and living a rich, full life that spans decades. In the final moments, it’s revealed that Kataan (dead for over 1,000 years) built the probe so that one person could live as one of them and tell their story. Picard lived 40 years in less than half an hour, and he ends up alone. It wasn’t actually the original story Gendel sent to Star Trek. A freelance writer at the time, he first pitched a story about an advertising blimp that would transmit experiences into someone’s brain. In it, Picard would envision being on an island with Commander Riker and Ensign Ro Laren, and a love triangle would ensue. Gendel told me the story evolved into Picard’s solo journey over time, after some rejections and rewrites. He got called in five times before they moved forward with the script. Similarly, it actually took eight tries for Margot Rose to get a part on Star Trek: The Next Generation before she finally got the role of Eline. Rose said she kept getting called in for auditions, but none of the parts worked out. Still, she told me she’s glad it ended up being Eline, calling it one of her proudest roles as an actor. “I never in a million years could’ve asked for a better part,” she said. “It was the best part I ever got to play on television. I’ve gotten to play some great parts, but it was the penultimate.” Rose added what she loved most about the part was Eline’s genuine sincerity, what she described as “guileless.” Eline was never mysterious, cunning, or had something up her sleeve. She was just a woman in love with a man who seemed to be going crazy, talking about another life. “He’s her husband, and she’s thunderstruck, let’s say, that he’s behaving the way he is. And she adores him, and it’s a little bit, it’s not just unnerving... it’s horrible for her because she adores him,” Rose said. Gendel, Rose, and Daniel Stewart unanimously agree that the glue that holds the entire episode together is Patrick Stewart’s performance. His portrayal of Kamin was not only genuine, but it also deepened our understanding of Picard as a person. For many of us, Star Trek is the ultimate escape, a fantasy world where we can pretend we’re the brave starship captain. Picard’s dream life is a quiet, subdued one, with a wife and children, and by the end he loses it all. That’s pretty messed up. But sadly, the series doesn’t really explore this beyond the end credits. At the end of the episode, Picard wakes up, back in his reality. His wife died before his very eyes. His children are gone, along with the life he spent decades building and making his own, but he doesn’t really address it again. There are references to his experience, like in the season six episode “Lessons,” but it’s never really given the gravity it deserves. 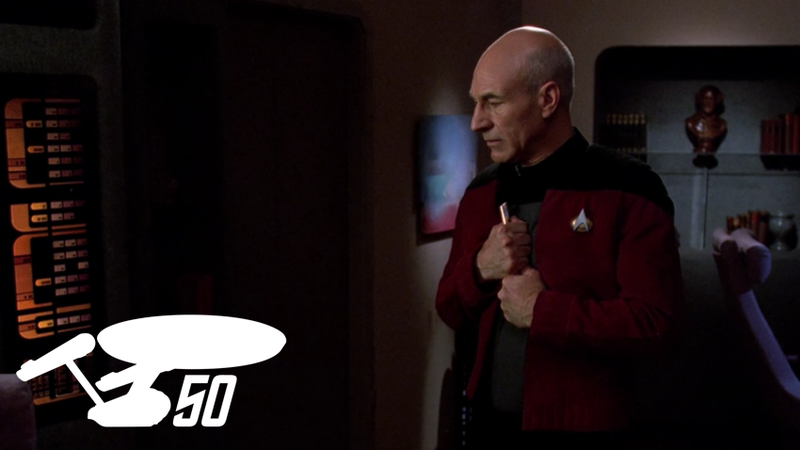 In truth, the only truly lingering proof that “The Inner Light” happened to Picard at all is his flute. Gendel said when he first brought up the flute in the writers’ room, someone actually laughed. They later reconsidered, and rightly so, because it’s now one of the show’s most iconic symbols. It’s been featured and mentioned several times over the series, and the melody got a full orchestral treatment. Daniel Stewart said he originally learned to play the song by composer Jay Chattaway, but he never got the chance to do it onscreen. His dad did, though, even if didn’t quite master the melody. The episode also had a lasting impact on Star Trek as a whole. As Gendel put it, every show that followed had its own “Inner Light” episode. Voyager had “Memorial.” Deep Space Nine’s version, “Hard Time,” actually featured Rose as Rinn (seen above), the alien who induces Miles O’Brien’s virtual 20-year prison sentence. Rose said she doesn’t know if she was cast on purpose, to connect the two episodes together, but she thinks that’d be cool if true. Gendel remembers a time at a Star Trek convention where he met a former Hell’s Angel who was inspired to change his life after watching the episode, and now has a family of his own. “This was a guy who was on one path, and realized he could change it and pick another path,” Gendel said. As it turns out, “The Inner Light” almost had a sequel. Gendel pitched a follow-up episode, where Picard helps out a group of Kataan survivors, including his wife Eline. It would have explained the technology behind the probe beam, and given Picard some closure from his decades-long experience. The story was rejected, so Gendel later turned it into a fan comic called The Outer Light, seen above. But “The Inner Light” still works on its own, and works beautifully. Rose, who’s accumulated dozens of acting credits over the years, said she still gets emotional whenever she watches the episode.